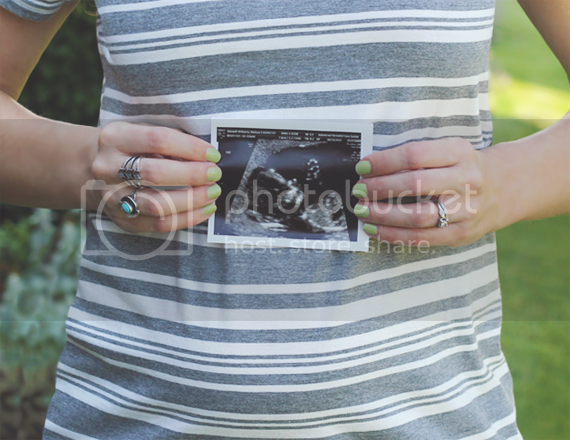 I am so excited to announce that Robbie and I are expecting our first child! I'm currently 15 weeks along, and I actually have the exact same due date that my mom had with me (which means I may no longer be the only New Year's Baby in this house!). We are more thrilled than I could possibly put into words to be starting this new chapter in our lives. Although I'll be saving the details of our story for another post, I will say that it has been a very interesting journey. I am one of those people who 'waited' to have children - I spent my twenties and the first half of my thirties focusing on my career and my travels. I always knew that I wanted children someday, but for so long it just wasn't a priority. Then a little over a year ago, the urge to be a mother hit me very suddenly and profoundly - and it didn't go away. Between Robbie's touring schedule with the band and our ages (I am considered 'advanced maternal age' which is medical lingo that means I'm over 34), we knew it wouldn't be easy. I'll just say that the day we got our positive pregnancy test in April was one of the happiest days of our lives, and despite three months of feeling constantly nauseous and exhausted, this has honestly been the most wonderful time of my life so far. Thanks for letting me (finally!) share this news with you guys. I am really, really happy. OMG! Congratulations!!!! That is such wonderful news- so thrilled for the both of you. Aaaaaah! Congratulations! This is SO exciting! Yay again and again! My beautiful niece and her handsome hubs are gonna have a baby! I am so excited for you! (and for my Mully too!) Much love and many prayers sent your way! I'm so excited for you two! Congratulations! so glad you're enjoying this oh-so special time...congratulations! Congrats! Ah that "advanced maternal age" is a pain isn't it? I'm 37, and my husband is older than me, we've not had any luck conceiving, but have made our peace with that. I can appreciate what a journey yours must have been. Enjoy all the moments to come! It is definitely a challenge! I'm sorry that you haven't had luck TTC, but that's wonderful that you've made peace with it. Sending hugs your way! How exciting! Congrats to both of you! Congratulations!! That is SO exciting. So happy for you both. My daughter was born when I was in my late 30s -- the only downside (other than being almost twice as old as some of the other parents of her classmates) was that she hit puberty when I hit menopause. Hormonal train wreck. But we survived it and I love her so much. Congratulations!!! What a exciting time! Oh wow! Congrats to you both!!! And to have the same due date that your mom had with you...Amazing. =0) I'm so happy for you, and I can't wait to read more of the story. I know you'll be terrific parents. There's no problem with waiting for the right time, either. Congratulations!! I'm happy and excited for both of you. oh my goodness beautiful melissa, i'm overjoyed for you and robbie! :) i look forward to you sharing whatever part of your journey that you wish. hooray! !!! Oh my goodness, I am SO SO SO SO happy for you both!!! CONGRATS!!! Melissa I'm so happy for you and your family! It's a very exciting time, wishing you health and happiness throughout. Congrats on your pregnancy! You're due 2 days before I am lol. I hope you're enjoying your pregnancy so far. Congrats! I'm so happy for you, that's wonderful! Congratulations!!!!!! So very happy for you!!!! Congratulations Melissa. This is certainly both wonderful and exciting news. oh my god melissa . i'm so happy for you .! you'll be a great mum i'm sure . i wish you two (i mean 3 ;) all the best ..
Congrats! Motherhood is an amazing experience. Congratulations Melissa! I'm very happy for you both :) Wishing you an easy, stress-free pregnancy. Oh my goodness! So happy for you, Robbie & the world. Knowing what a great mom you were to bubbies always thought what an amazing baby mama you would be. Congratulation! It couldn't happen to a better person. So excited for you. You are the best of us all. Such great news! Thrilled for you and your new "lil' bean"! Aw, CONGRATS! :) So exciting!!! eeeep! what exciting news! can't wait to hear more! Congratulations! It is such a great news.